When I call my children for craft-time I am always met with shouts of joy and lots of excitement. They are ages 5, 6 and 7 and it is always their favorite time of our school day. When they have a Kiwi Crate it elevates craft time to new levels and is a big hit! What is a Kiwi Crate? Designed for children ages 3-7 this subscription service (you can also purchase an individual crate) delivers a crate full of fun and educational projects and activities. It includes everything needed to do lots of creative activities with a unique theme. 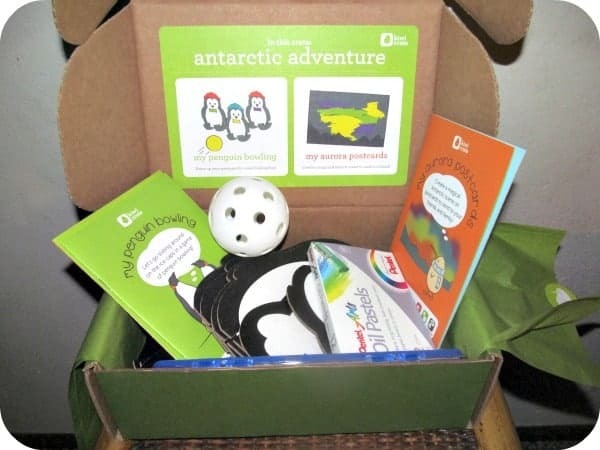 For example, we recently received the Antarctic Adventure from Kiwi Crate which included three fun activities i.e. Penguin Bowling, Aurora Painting and Ice Experiments. The materials are always of the highest quality and the directions are easy to follow. My children absolutely adore Penguin Bowling and they concentrated so hard on perfecting their cute penguins and enjoyed a friendly game of “Penguin Bowling” with their friends. There are lots of Kiwi Crates available for purchase as part of the subscription service or individually ($19.95 each) and these make excellent gift ideas. There are themes for the crates such as “Dig Into Dinosaurs”, “Planting Gardens” and “Colorful Inspiration”. If there are additional siblings or children then you can even add on to the Kiwi Crate materials for only $7.95 extra per month. That way you don’t have to worry about the kids fighting over who will get to do the project/activity because I promise you everyone will want to participate in my personal experience. Winter is the perfect time to gift or sign up to start your Kiwi Crate subscription because these are great for those cold days when weather doesn’t permit going outside. You are invited to visit Kiwi Crate’s website to browse the available crates, subscription options and sign up for the one that works best for you. A monthly subscription is only $19.95 per month and an annual subscription is available for $220….shipping is free! What a great gifting idea! I would love to give this to my three nephews! Thanks, I had never heard of this product before. What a great gift idea! Something that is not only fun but something that uses imaginative play! What a great idea this is! It would be like a Birthday every time a box arrives. Thanks for sharing about the Kiwi Crates. Great idea! I just signed up for an Annual Subscription… This is wonderful for my little guys who don’t go to school yet.